After a very long break I start to work on wordTube again. I recognize that the plugin features for the JW Media Player are now much easier to implement and so I added this feature to wordTube. So what is the benefit for you ? Please note : wordTube 2.0 require WordPress 2.6 and the JW FLV Media player 4.0, it doesn’t support earlier versions. I’m currently thinking what would be the best solution. For a intermediate solution I will now add a “config” file where you can add “server path” to wp-load.php in the case you moved the plugin folders. The disadvantage of this solution is the automatic upgrade procedure, because every upgrade wipe out your changes (Mhh, would be not a good idea to have a way to exclude files from the upgrade procedure ??). I’m happy for any comments / ideas for a better solution…. We need Media RSS ! you can be sure this is my next task ! Thanks for this quick addon! 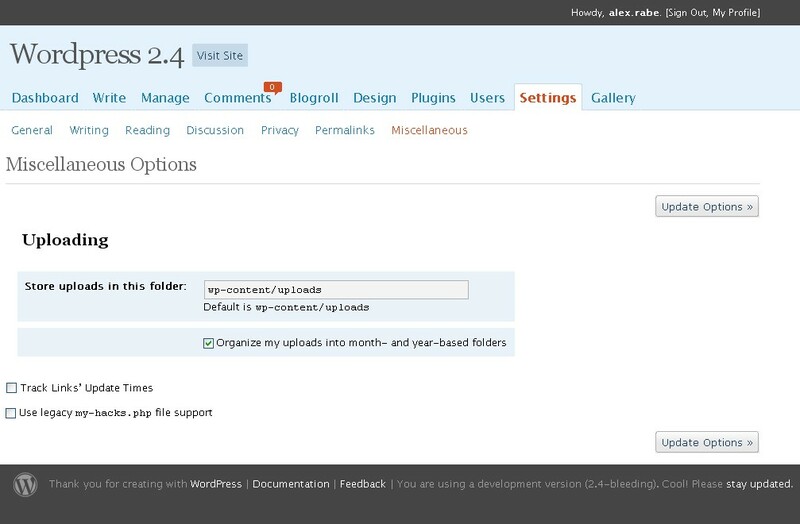 It’s maybe a little bit early, but WordPress 2.4 will contain a new backend style. Here a very first (very very rough and not finished !!!) screenshot of the user setting page.